学習（ Learning ），理解（ Understanding ），人工知能（ AI ），深層学習（ Deep learning ），論理学（ Logic ），形式体系（ Formal system ），演繹（ Deduction ），帰納（ Induction ），証明（ Proof ），形式論理（ Formal logic ），非形式論理（ Informal logic ），数学（ Mathematics ），データ構造（ Data structures ），代数的構造（ Algebraic structures ），集合（ Set ），モノイド（ Monoid ），Monoid action，M-Set，群（ Group ），ベクトル空間（ Vector spaces ），線形写像（ Linear transformation ），圏（ Category ），可換図（ Commutative diagram ），マップ（ 射, morphism, function ），ラムダ抽象（ Lambda abstraction ），全射，単射，全単射（ epi, mono, iso ），同型写像（ Isomorphism ），"Up to isomorphism"（ "同型を除いて" ），ファンクタ（ Functor ），自然変換（ Natural transformation ），モナド（ Monad ），確率論（ Probability ），統計学（ Statistics ），情報理論（ Information theory ），物理学（ Physics ），相対性理論（ Relativity ），テンソル（ Tensor ），テンソル積空間（ Tensor product space ），心理学（ Psychology ），ハード・サイエンス（ Hard science ），ソフト・サイエンス（ Soft science ），詐欺科学（ Pseudoscience ），言語学（ Linguistics ），法学（ Jurisprudence ），計算理論（ The theory of computation ），etc. 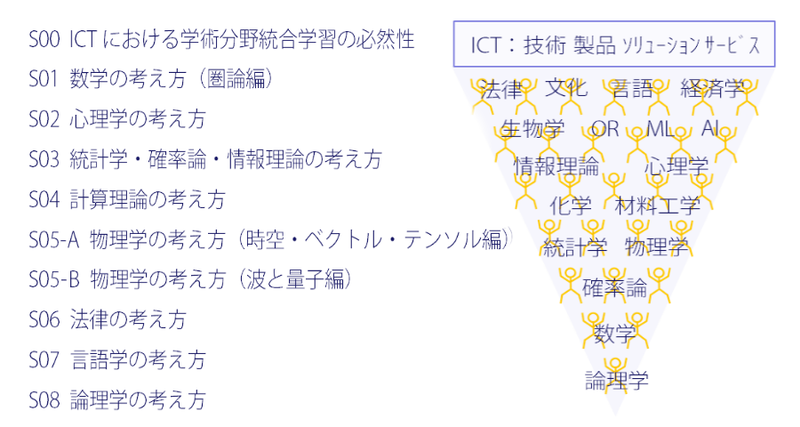 冨元 雅仁 published 【eLV勉強会】 ICTを支える「考え方」シリーズ：S00 ICTにおける学術分野統合学習の必然性. 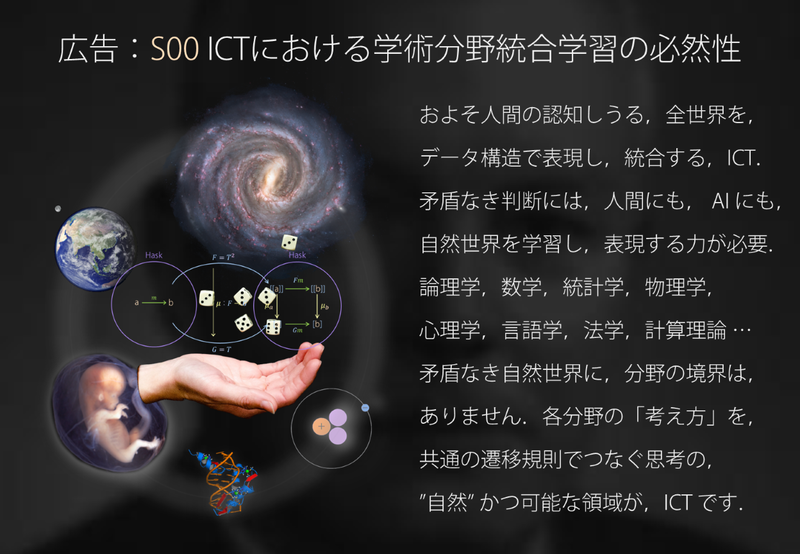 I joined 【eLV勉強会】 ICTを支える「考え方」シリーズ：S00 ICTにおける学術分野統合学習の必然性!